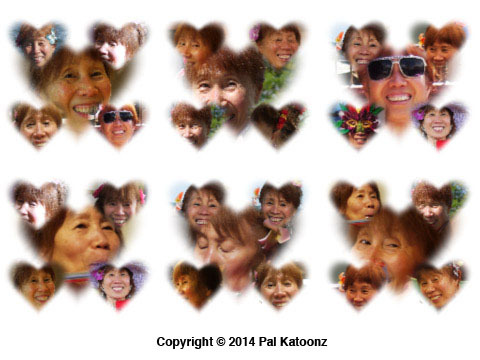 Pal Katoonz™ is a one-man company run by Duane Palyka, a 72-year-old artist who programs computers. The creation of these programs was inspired by working with traditional animators who worked on Popeye and Betty Boop-- artists who love to draw on paper but have difficulty bringing their work to completion using computers. PalkArt™ is a unique way of creating images by manipulating grids and creating lines and shapes from grids and freehand drawing. PalkArt™ extracts information from photographs, text and drawings, vectorizes it and outputs complex pictures of different sizes. PalkArt™ is written in the Java Programming Language and runs great on Apple's own version 6 of the Java Runtime Environment. However, until I join the Apple Developer Program or get PalkArt™ approved by Apple, Apple makes it difficult to download PalkArt™. 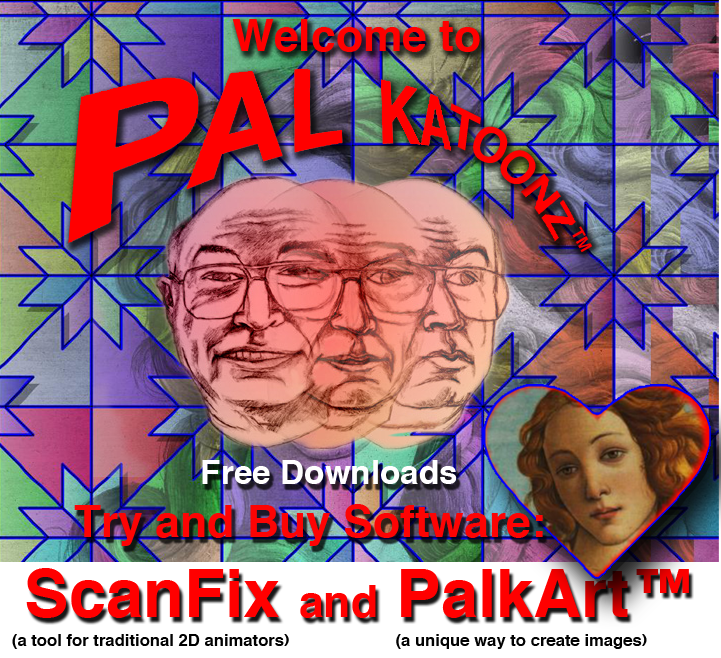 Please follow the Installation instructions to download PalkArt™ successfully. With PalkArt, you can create the "animated gif" animations you see on this page and in Tutorials. In addition, you can change the size, change the timing, add dissolves and repeat as many times as you want. New additions: The Multiple Button and the Feather Slider simplify the cropping and feathering of composited images. "PalkArt is Photoshop on Steroids"
"Combining geometry, lines, shapes, splines with images, pixels, etc is the hard part, as you know"
"'I work more like nature does than as an engineer does. I develop modules of code that get modified and reused for each function that emerges. -- Nice, opposite of most commercial graphics tools such as Photoshop." PalkArt™ was used to create graphics for the Remembering Frederick Douglass concert. Click HERE to view a trailer of the concert. ScanFix is now Available at a One Third the Original Price! ScanFix assists traditional 2D animators who draw on paper and scan their drawings into a computer. When animators scan using a bulk scanner, the scanned drawings lose their alignment. Their digitized frames are offset and twisted relative to each other by the scanning process. ScanFix will realign peg holes on bulk-scanned animation frames so they match the original pre-scanned alignment. It also rotates the drawings in a user-selected direction for viewing and performs a flip-book style pencil test of the scanned and adjusted animation. You can try different "frames-per-second" speeds on your animation or scrub through them to see subtle differences. ScanFix will input either TIFF files or JPEG files and will allow you to select which frame you wish to use to set the alignment. ScanFix does bulk processing of both black-and-white and color drawings in any orientation or pager size. ScanFix finds the peg holes by searching all edges. 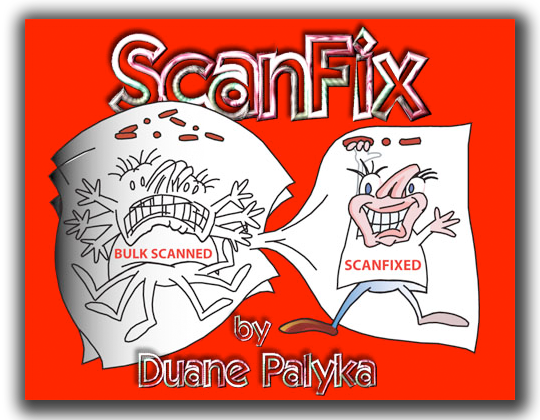 Click here to download a copy of ScanFix. ScanFix is written in the Java Programming Language and runs great on Apple's own version 6 of the Java Runtime Environment. However, until I join the Apple Developer Program or get ScanFix approved by Apple, Apple makes it difficult to download ScanFix. Please follow the Installation instructions to download ScanFix successfully. Check out my "bio" at http://www.pal-katoonz.com/duane.html. You can see my online portfolio at http://people.rit.edu/dpalyka/Duanes-Portfolio.html. You can view and download a 3000H x 9950W copy of "Green Band Portrait" here.